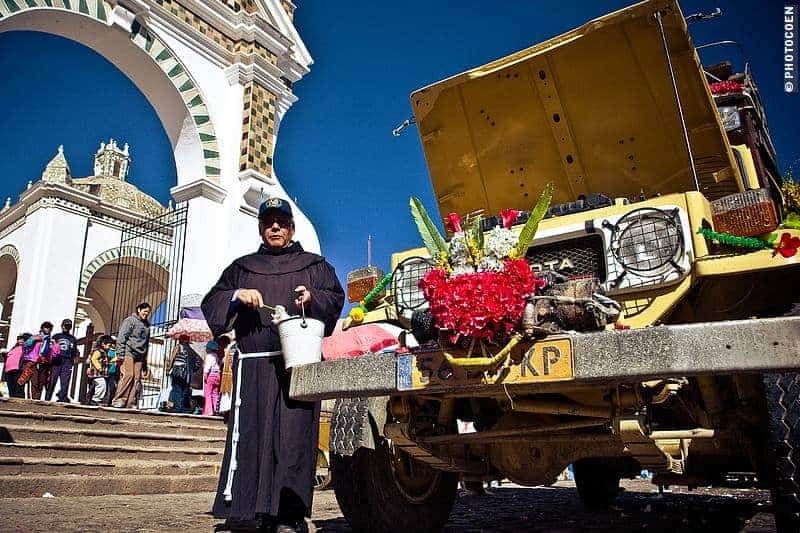 The snow-white Basilica of Copacabana, along Lake Titicaca in Bolivia, is the backdrop of a weekly ritual: La Benedicion de Movilidades. 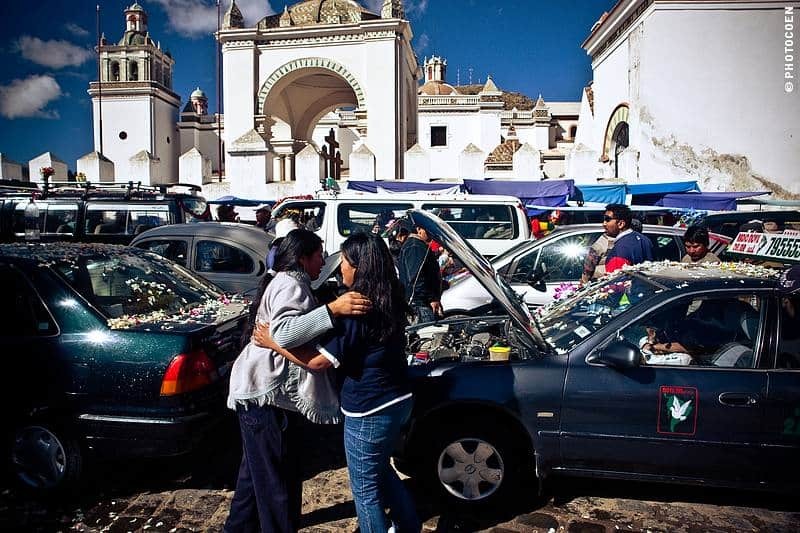 During this ‘Blessing of Vehicles’, vehicles gather in front of the home of the Virgin de Candelaria, decked out in a spectacular display of flowers and plastic knick-knacks. Priests bless the vehicle for a safe journey home while champagne is poured and fireworks go off. After a six-month, stressful restoration of the Land Cruiser, we feel it can definitely use a blessing before we hit the road again. Engine Problems, or Copacabana’s Altitude? It’s Sunday morning and we enjoy an idyllic breakfast along Lake Titicaca. 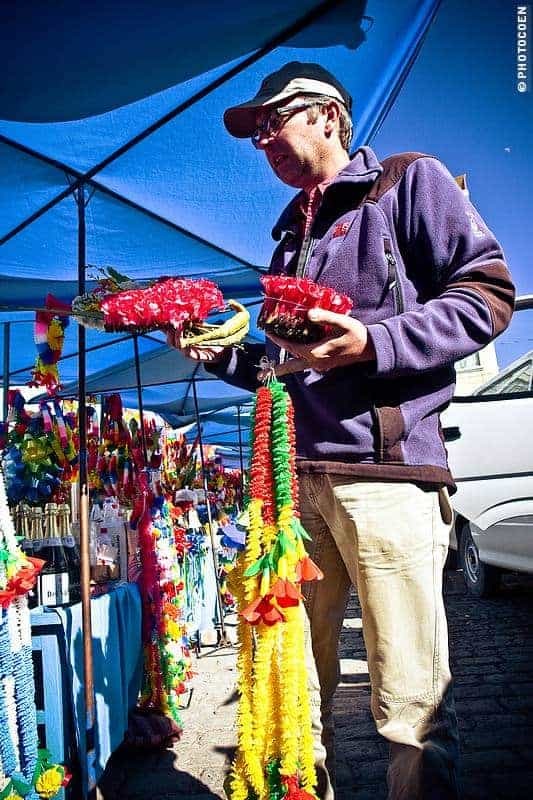 While we let the early sunbeams warm us – at night temperatures plummet to 0 degrees Celsius – we see how the first tourists buy tickets for a ferry to take them to Isla del Sol, one of Lake Titicaca’s main tourist attractions. Coen starts the engine but it takes a lot of effort. Something is wrong, as if the engine doesn’t preheat properly. It’s a problem the Land Cruiser has never had before and Coen has another puzzle to solve – we hope it has to do with Copacabana’s altitude but this doesn’t make sense as we’ve driven so much on altitude before without having this problem. With lots of black smoke and loud noise the engine fires. We need a blessing, I tell you! We drive downtown and find a spot among the large number of cars that are all waiting in front of the Cathedral of Copacabana. The plaza is a hive of activity. 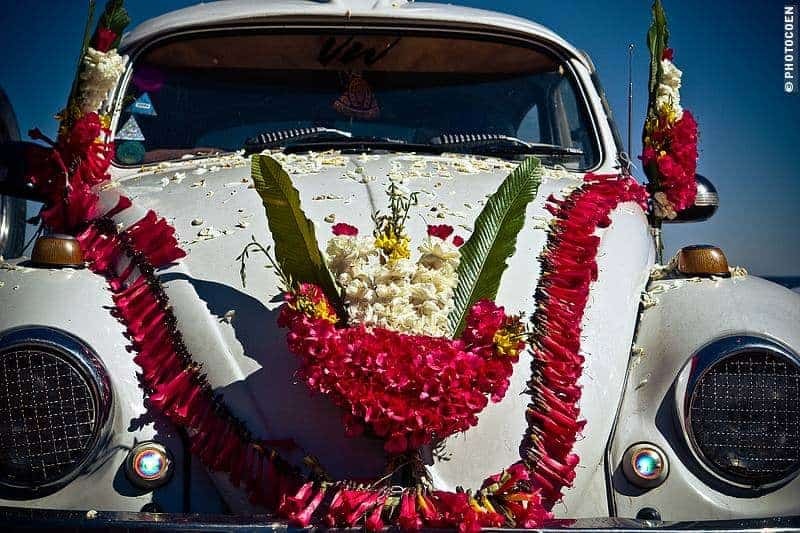 People are all busy decorating their vehicles with flowers and garlands. Bottles of champagne stand next to the rows of firecrackers. This is thé place to have your car blessed. 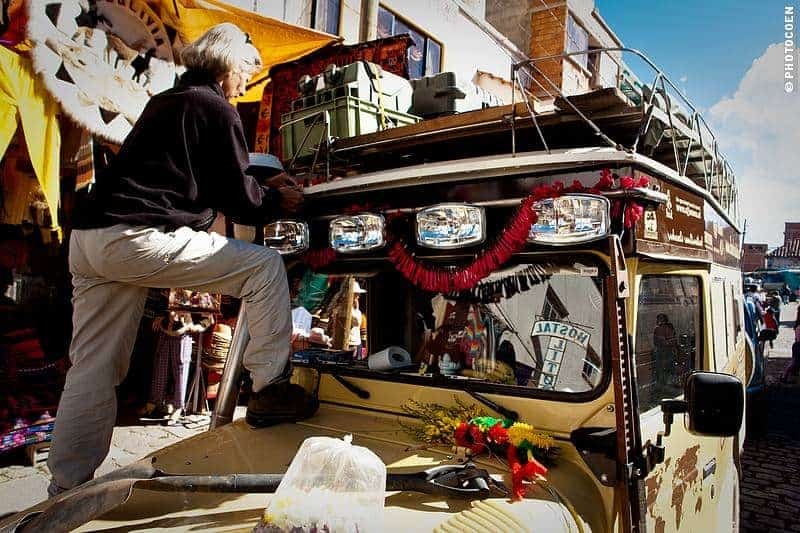 After the intensive as well as extensive overhaul of the Land Cruiser it seems fit to have it blessed before starting a new phase of our nomadic existence. 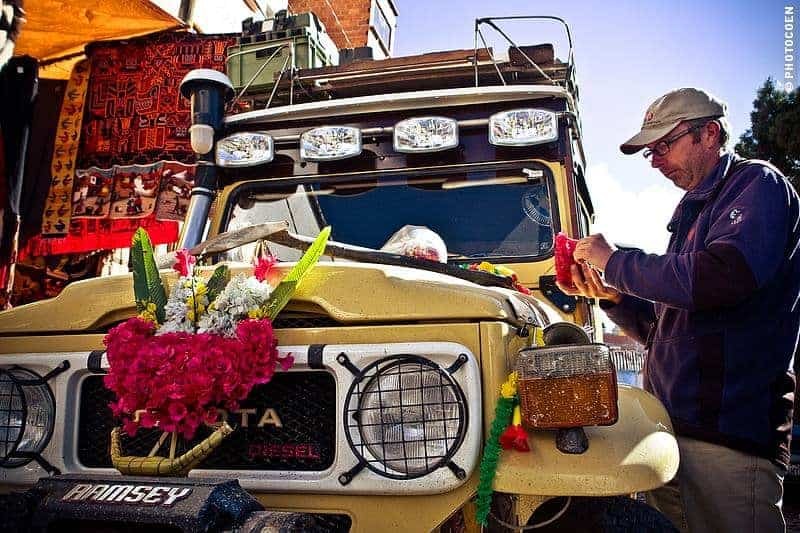 We walk up to one of the many stalls where a woman tell us how to go about properly festooning the Land Cruiser; what flower arrangement should be attached to the radiator, which flowers to be tied to the mirrors and what garland ought to be draped over the roof and how flower petals should be sprinkled over the hood. 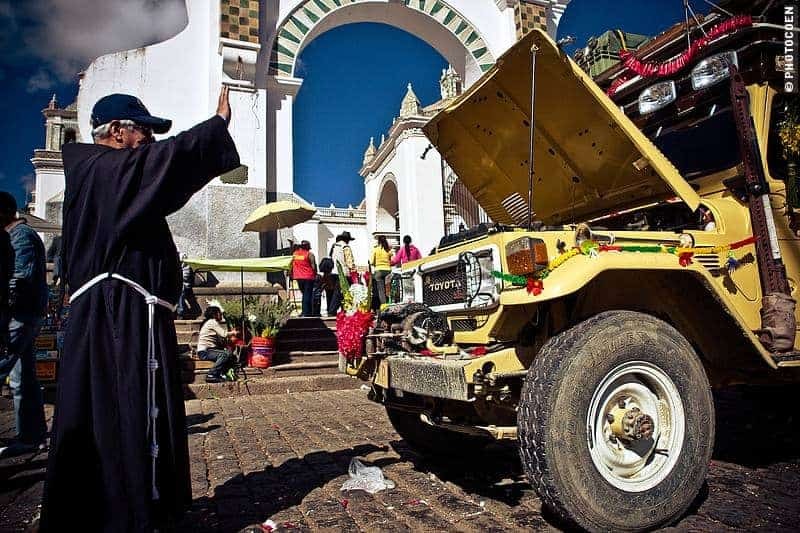 For fewer than five euros the car is properly prepared for its blessing. Next we have to find a priest. 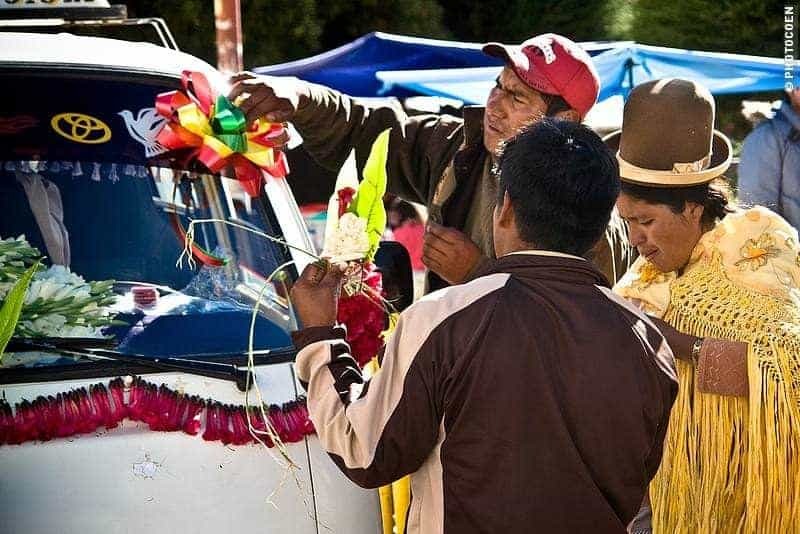 They walk among the vehicles waiting for owners to indicate their car is ready for a blessing. I see two: one entirely dressed in white, the other in black. Suddenly I realize that tickets need to be bought and I search for a while before I find the ticket office behind the cathedral. I return, short of breath, and hand the ticket to the priest. Meanwhile a police officer is scolding us for dallying. The first cars have left and we all have to move forward. This gives us the pride of place, right in front of the cathedral. We are not complaining. The priest in black walks around the Land Cruiser, sprinkling it with holy water while mumbling prayers for a safe journey. Later we discovered that pouring champagne over the car (including the spare tire!) and setting off fireworks were popular elements too for many visitors today. 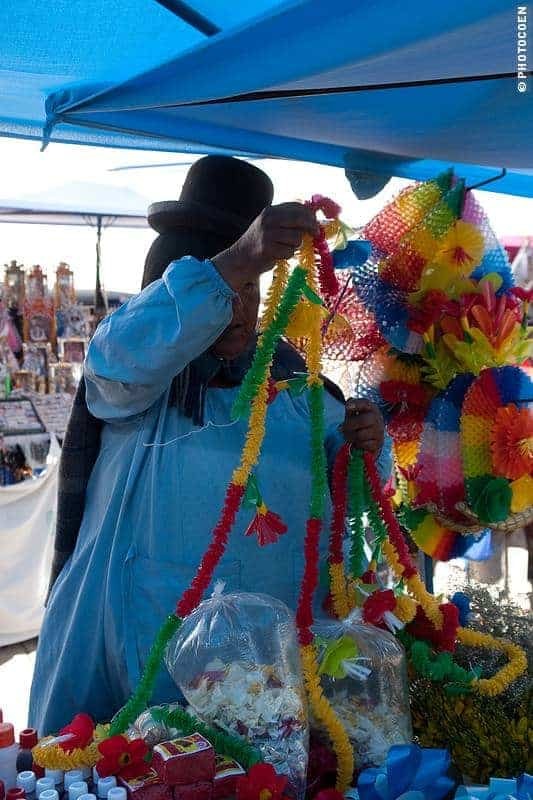 It is a merry happening that gives insight into the beliefs and superstitions of the local people. 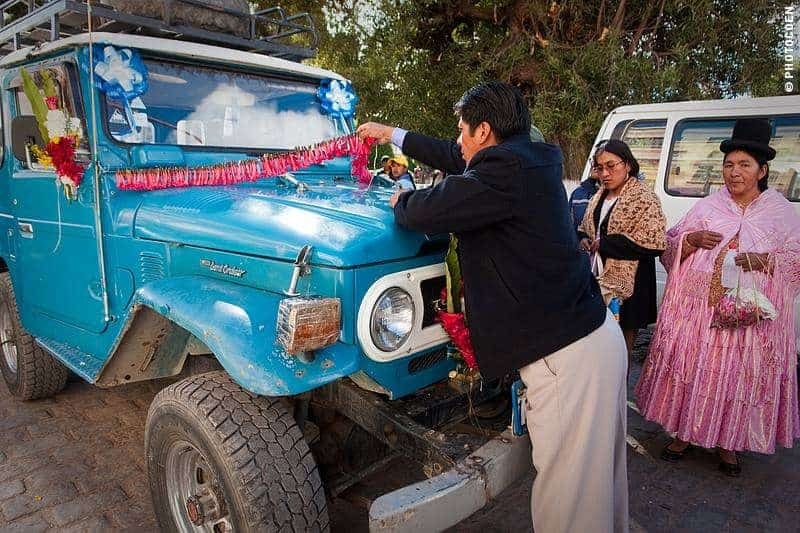 Together with the ch’alla (a ritual blessing, whether Inca, Aymará or Christian, which occurs on many occasions throughout the country – for example during la Fiesta de las Alasitas) with champagne by Jaap and Carla a few weeks ago in La Paz – on the day the Land Cruiser left the workshop after the restoration job – we feel that the Land Cruiser is ready to hit the road again. Okay, so, along with about a hundred other unfinished details, the Land Cruiser doesn’t start properly, Coen’s door doesn’t close, the handbrake doesn’t work and it is an enigma as to why the 12-volt isn’t functioning. But we consider these to be teething troubles that hopefully need only a little time to be fixed. For that we return to La Paz, but we’ll be back for more exploring (edited to add: we were, read here). La Benedicion de Movilidades takes place each Saturday and Sunday, around ten and two o’clock.